New “Pro-Am Series” will feature 4 beers annually, designed by amateur brewers. Beau’s All Natural Brewing will release a Double IPA called DoubleWide this Thursday January 19, as part of its new “Pro-Am Series”. The initiative will give talented amateur brewers the chance to brew their best recipes into a full batch of beer at the brewery, under the watchful eye of Beau’s master brewer Matthew O’Hara. O’Hara is excited about the new project, which will see him paired with amateur brewers to refine their recipes and prepare them for a commercial batch at Beau’s. “We wanted to do something to highlight where innovation is strongest in the craft beer world, and amateur brewing deserves that credit. Homebrewers are constantly trying new techniques or ingredients, and it sets a pace for the industry. It’s inspiring,” he says. DoubleWide, the Pro-Am beer releasing this week, was designed and brewed by Brad Clifford, an amateur brewer from Toronto. Clifford won the Great Canadian Homebrew Competition, held by the Canadian Amateur Brewing Association (CABA), with the prize being a Pro-Am brewing day at Beau’s. This is Beau’s third “CABA CABA Hey!” collaboration project with CABA, and inspired the idea to add to the CABA series with 3 additional Pro-Am releases annually. DoubleWide is an American-style India Pale Ale that has been ramped up in bitterness, aroma and strength. A process known as first-wort hopping (hops added to the wort before boil) was employed in making DoubleWide, to add extra flavour and aroma. The 8% abv beer has massive hoppy and bitter ale flavours, with classic citrusy American hop aromas. Beau’s Matthew O’Hara suggests pairing it with bold, flavourful and spicy foods (think jerk chicken) that match the style’s intensity. DoubleWide will sell in 600 ml bottles at a retail price of $7.85 including tax and deposit. The beer can be purchased at the brewery retail store beginning January 19. Pre-orders have begun online through BYBO (www.bybo.ca), the Ottawa home beer delivery service, delivery begins on the 19th. A release party will be held at The Rhino (1249 Queen St. W in Toronto) beginning at 7 pm on Jan. 19. 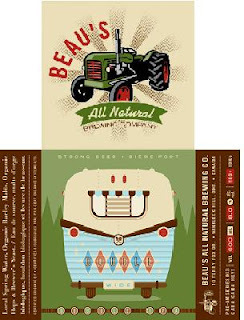 Brad Clifford’s creation DoubleWide will be featured on tap that night, as well as 4 additional offerings from Beau’s.